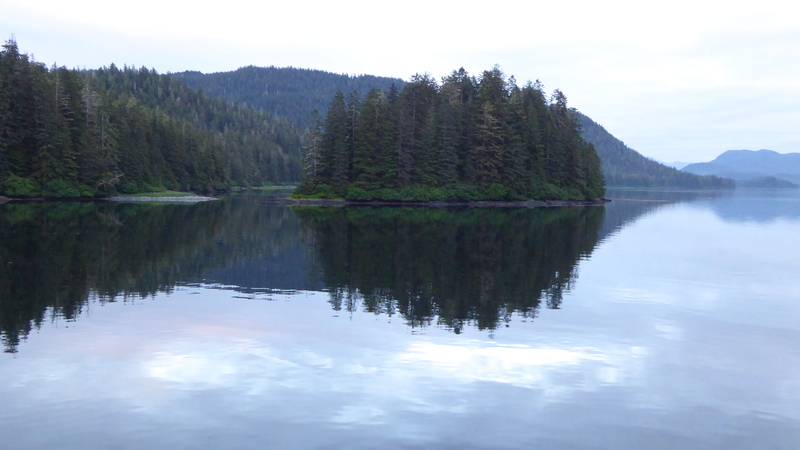 Our last afternoon in the Inside Passage was spent in a delightful bay… waiting. 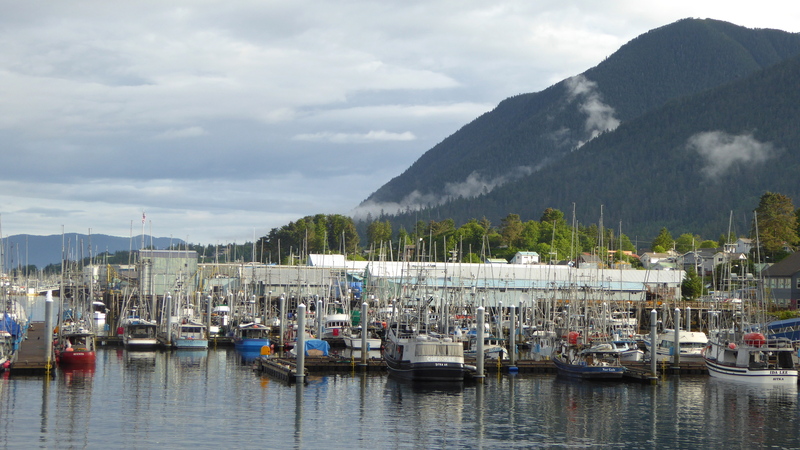 Our destination for the day was the town of Sitka out on the western coast of this part of Alaska. And to get there, we had to negotiate Peril Strait. As it’s name suggests its not the easiest place to navigate with tide changes up to 7m through the narrows. So we waited for the right time to sail towards the narrow passage and had an interesting afternoon checking out each others photos. Everyone was asked to add three photos to the pool and it proved to be fascinating to see what each person added. Later, as we moved towards the passage, we did a side trip into a wide bay which seemed to be full of whales. Having taken many whale photos, this time we just enjoyed them. One or two performed amazing breeches right out of the water, but most were just feeding. After a while, I decided to get my camera. Lucky! As I left our room, a whale came right up beside the ship and gave me a wonderful wave of the tail. Then it, and most of the other whales, seemed to vanish. It was as if this one was saying good bye. We sailed on. 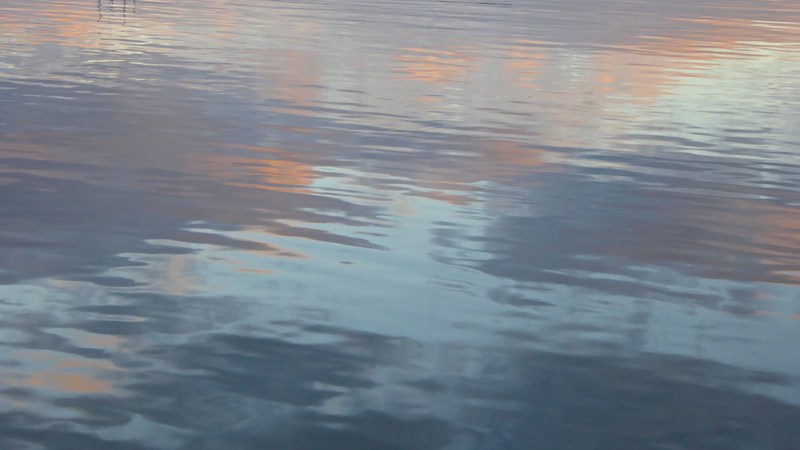 Dusk was gathering as we entered a more narrow passage of water. All seemed very still. BUT the water way ahead of us was treacherous; the tide coming in and going out very rapidly and all ship’s captains have to be especially vigilant in these waters. The ship glided slowly towards our appointed time to go through Peril Strait. There is a definite process to be followed and our Captain had applied for our specific time. The Tlingit natives had a name for this strait- Haat xhishxhaak. 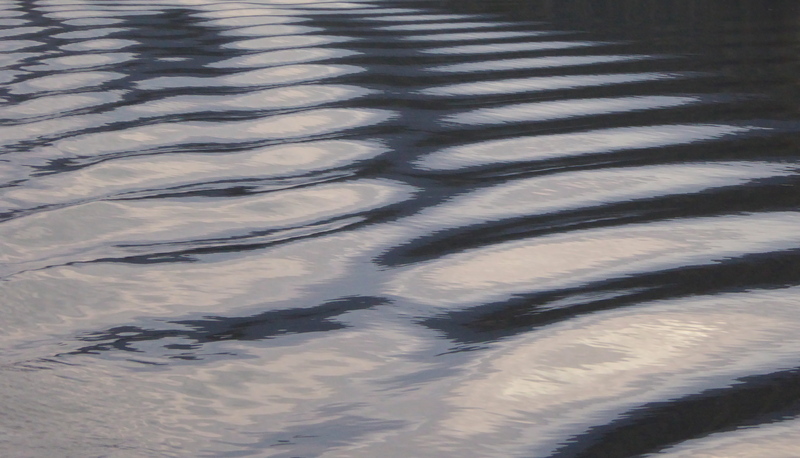 Haat meaning tide, rapids, whirlpool or back-eddy; and xhishxhaak meaning, appropriately, to sit down! They would pull there canoes to the bank to wait for the tide to be just right. The view back from the rail outside our room. Night approached. There was a strange eeriness about these waters. And many have perished here. 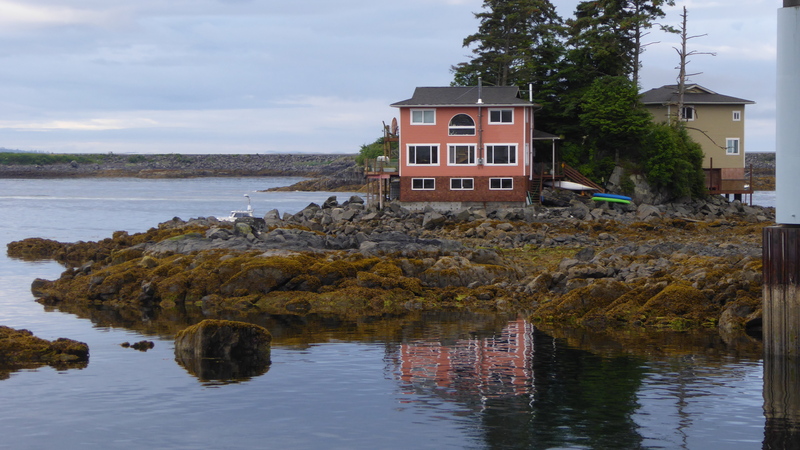 One story tells of some native Aleut seal hunters who pulled in here to await the tide change. While waiting they had a feast of shellfish. Unfortunately for them, the shellfish were poisonous and about one hundred and fifty of these men died. Where they died is now called Poison Cove and Deadman’s Reach. Not the best of bed time stories! 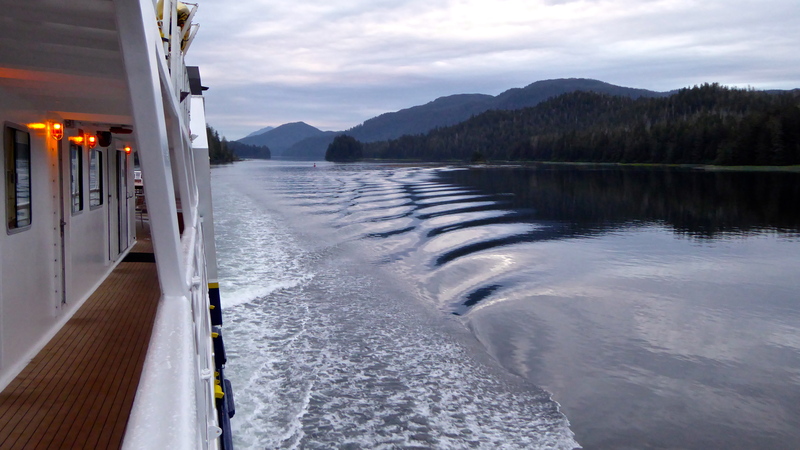 After watching the moving shapes in the waters for some time, I finally turned in for some shut eye, trusting the Captain and his crew to get us safely to Sitka. The map shows where we had travelled on this wilderness adventure. I woke to the sound of the engines slowing down. We had arrived. Dawn was breaking. 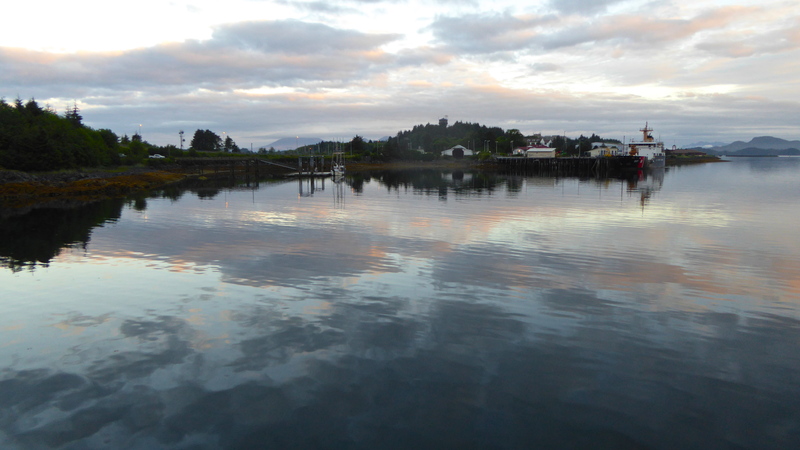 The clouds were mirrored in the still waters of Sitka Harbour. Looking out from our room was our first sight of a Sitka residence. We made our way under the bridge to the dock. This is a big bridge that takes a road to almost nowhere. Fir the only way into Sitka is by sea or by air. There are only 22.5 km or (14 ml) of road in this town; half go east-west and half go north-south. We had chosen to stay here for an extra night. Was that wise in such a small town of only 9,000 people? It’s always hectic when a ship comes into its final port. Bags have to be out by 7 am; breakfast is earlier than usual; everyone must leave the ship by 8am. But while I waited, I took some time to check out the harbour around us. It’s a busy fishing port. Fishing boats of all sizes were moored near the fish co-op. In deeper water, a larger ship unloaded its cargo. These ships are the life line for the townspeople bringing in cargo from the larger cities. The tide was well out. Its just as well they have variable gangways up to the docks. It was time to farewell our good ship ‘Sea Lion’ and our Captain and crew. They had all been wonderful. What would we find here in Sitka? 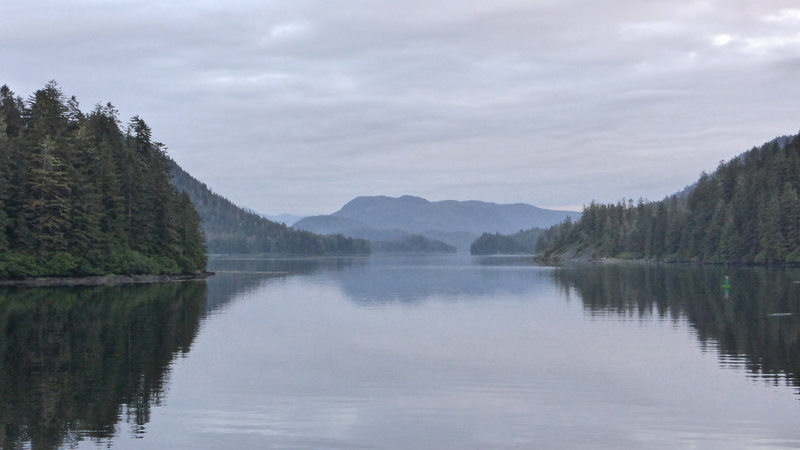 We had read that in March 2013, the Smithsonian Magazine named Sitka as #9 in its top ten towns in the USA! That’s quite some call… so we looked forward to exploring here for a couple of days. And we’ll share that with you all anon.